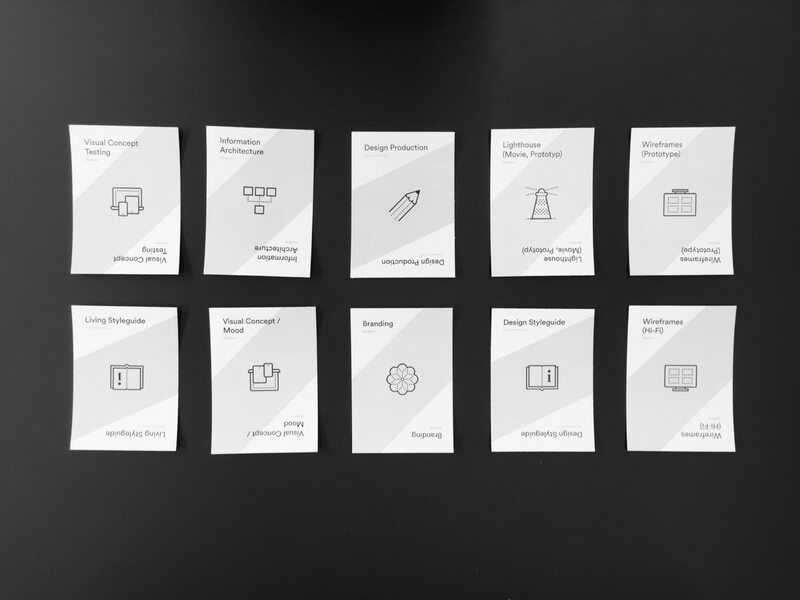 Sample project artefact cards used in our design production process. These are questions that have been bugging me and our team and they have been the subject of many articles and debates. As a UX dude, I generally vote in favour of such an artefact. At the same time, I have met opposition from co-workers. That’s why we have tackled this issue at our agency Hinderling Volkart. Well, this solves the questions on a philosophical level but doesn’t provide you with guidance when working on a real-world project for a client. That’s why we agreed on setting up a whitepaper to help our process and workflow in our team. Here is what we did and what you could do, too. Debating the topic in our design team revealed that there are varying perspectives and opinions when it comes to wireframes and their purpose. 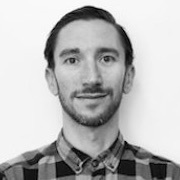 In the end, wireframes are only one artefact in the entire design production process. 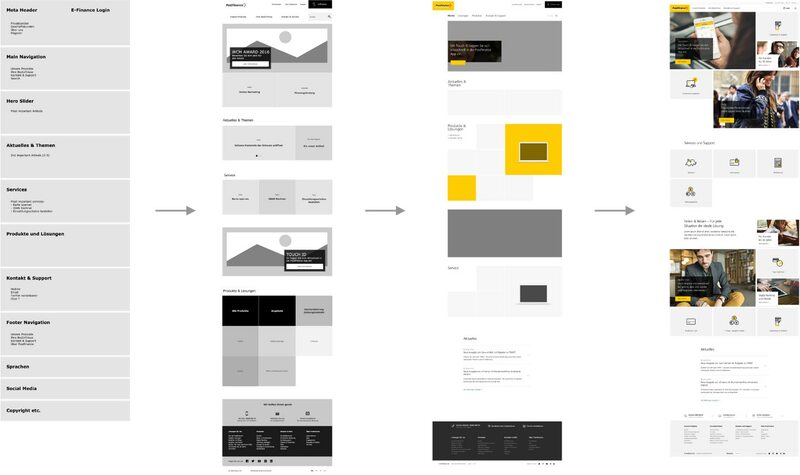 Thus, questions arose regarding the differentiation of wireframes, mockups, prototypes and design, the general wording and the definition of these terms. What: Type and name of the artefact. When: Point of relevance or delivery in the process (see below). Why: Definition of why the artefact is needed in the first place. How: Form, fidelity and required know-how and resources to produce it. For Whom: Target group and recipient (e.g. internal or external stakeholder) based on the purpose of an artefact. 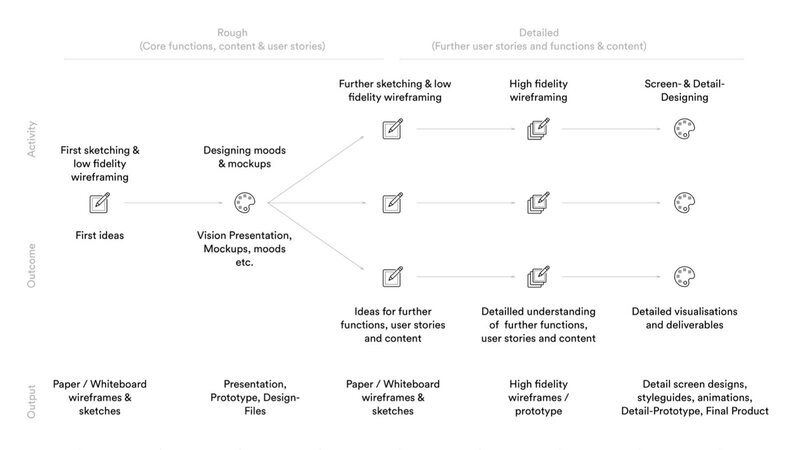 Visualisation from internal Hinderling Volkart white-paper showing a potential project flow starting from ideation into an agile design production process with various work packages. We have lined out rough steps in the design production process to have a better and common understanding of what artefacts to select at what stage. This categorization is neither to be confused with a project management methodology nor is it meant to represent all other activities such as testing, content production, programming etc. Presentation, mockup, moods, prototypes etc. There are countless terms and definitions of artefacts used in a design production process. Get your team together, talk and create a common and unified understanding. Define attributes for your deliverables to help you judge their value and need in a specific project. Do you need wireframes? No, you don’t. Nevertheless, they may help your process and before you abandon them for good, understand why, how and when you do or don’t want to use them in the first place. Credits to Milo & Adrian Zumbrunnen contributions & editing. Note: Thanks to Dan for the contribution. Originally published on Medium. Dan Nessler / UX Director with Hinderling Volkart in Zurich, Switzerland. In 2016 I finished my master's thesis – UX for New and No UIs – at Hyper Island, Manchester, UK. Follow on Twitter.